Hundreds of IAM members were joined by elected officials and area union members in Bloomington, MN, for a rally to support what is likely to be the largest and most important union organizing drive in decades. The “Day of Action” rally, organized by Local 1833, was part of the IAM’s nationwide fight to win bargaining rights for workers at Delta Airlines. The largely non-union Delta merged last year with highly unionized Northwest Airlines, setting the stage for an election to determine representation rights at the combined carrier. The IAM, which represent more than 15,000 workers in seven classifications at Northwest, is conducting a massive education campaign to explain the National Mediation Board (NMB) election process, which requires 50 percent (plus one) of each combined classification to cast ballots. If less than 50 percent of each combined group casts ballots, no representative will be certified. “It’s important to understand that this fight is a fight for every transportation union in America,” said IAM Transportation GVP Robert Roach. U.S. Senate candidate Al Franken, U.S. Representatives Keith Ellison (D-MN) and Rep. Betty McCollum (D-MN), along with several state leaders and members of the Association of Flight Attendants, Minnesota AFL-CIO, and AFSCME were all on hand for the event. 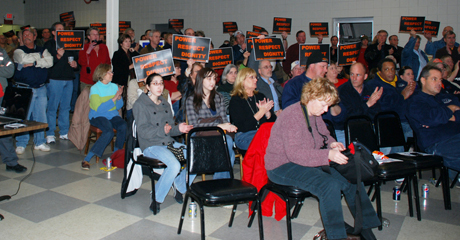 Wearing t-shirts emblazoned with the words “Union Strong,” they pledged their support for the Machinists’ campaign.